On the 23rd April I will be pairing up with Mercat Tours to provide a Sketching and Storytelling Tour of the Royal Mile. In preparation for this dream collaboration I tagged along on the Secrets Of The Royal Mile tour this week, and made a few sketches along the way. 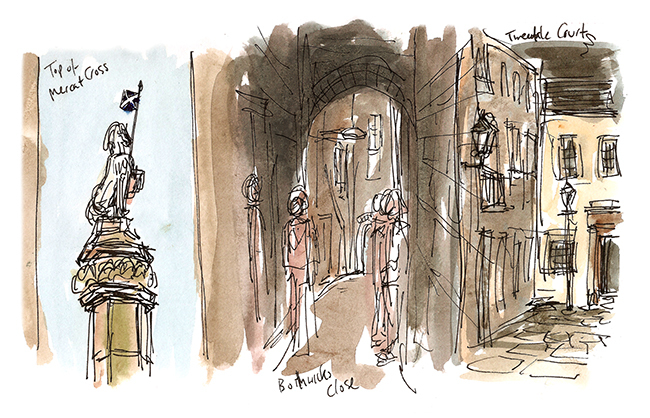 The above sketch includes three locations: The Mercat Cross (top), Borthwick’s Close and Tweeddale Court. The Royal Mile is where I began Edinburgh Sketcher, inspired by the tall narrow buildings, winding cobbled closes and rough knobbly walls that people have brushed along for hundreds of years. 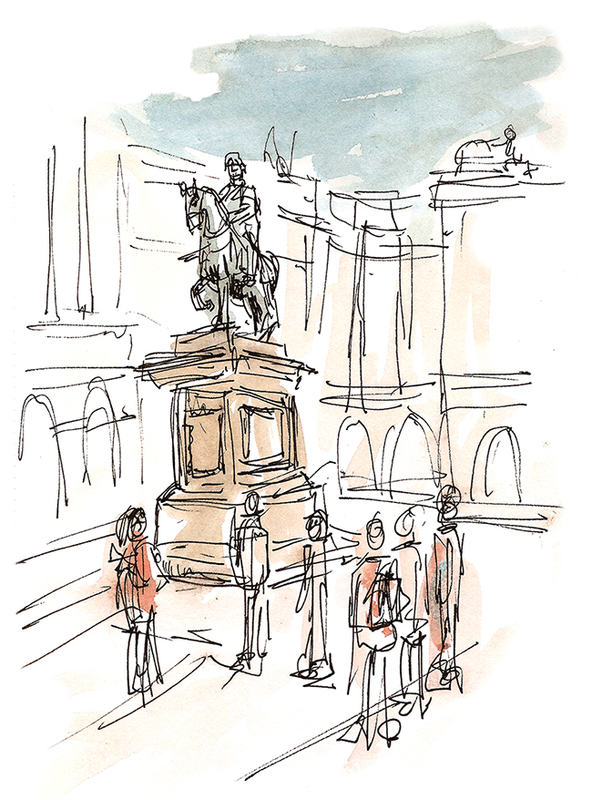 I am thrilled to be combining Edinburgh’s history and my passion for drawing, so come sketching with me and Hannah, our Mercat guide – you will find out some fascinating and very funny Scottish history, and learn some speed sketching skills to enable you to to capture your visit as a piece of art. All abilities are welcome, sketching is all about enjoying your surroundings, relaxing into the moment and noticing the beauty that is all around us. 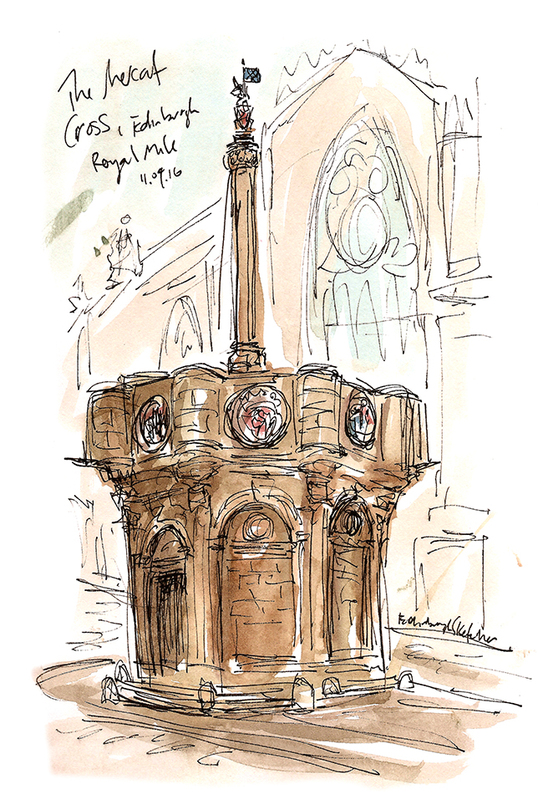 Sketching by the Mile from Mercat Tours will take place on Saturday 23 April at 10am. The tour has a very limited group size so booking in advance at the link below is recommended to avoid disappointment. These sketches are all made with fine liner black pens and watercolour, which we will be using on the tour. Hi Wendy. Thanks for your comment, this sounds like a perfect collaboration and something I have done in the past. I will email you shortly. I work for Historic Environment Scotland. We run several family events throughout the year related to architecture, architectural conservation and traditional materials and skills. I really like the idea of quick sketching of buildings during tours – please could you let me know if you are available to do workshops (a small workshop as part of a larger event) and what the hourly or daily rate would be?